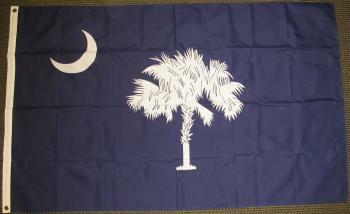 South Carolina state flag in the popular 3x5' size. Printed on a lightweight, single ply polyester material. A great value flag. --- While the crescent shape on the South Carolina flag is considered by many to symbolize the moon, it actually is representative of the crescent shape on the front of the caps worn by Revolutionary War soldiers from SC. The palmetto tree, also indicative of the Revolutionary War, was added in 1861 to recognize their importance in defending the soldiers on Sullivan's Island during bombardment from the British.